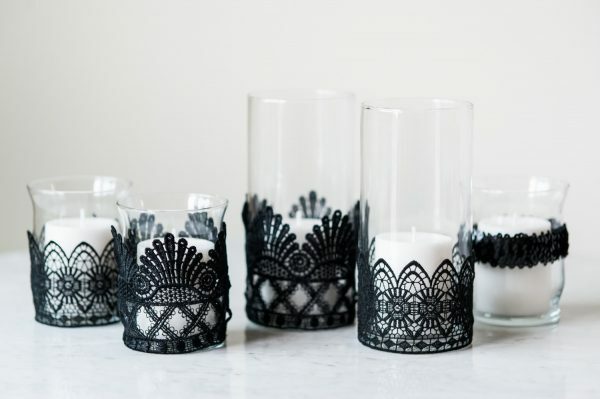 As much as I really, truly love Halloween (or, more specifically, watching Hocus Pocus on repeat), I will admit it is just not traditionally my go-to holiday when it comes to crafting. 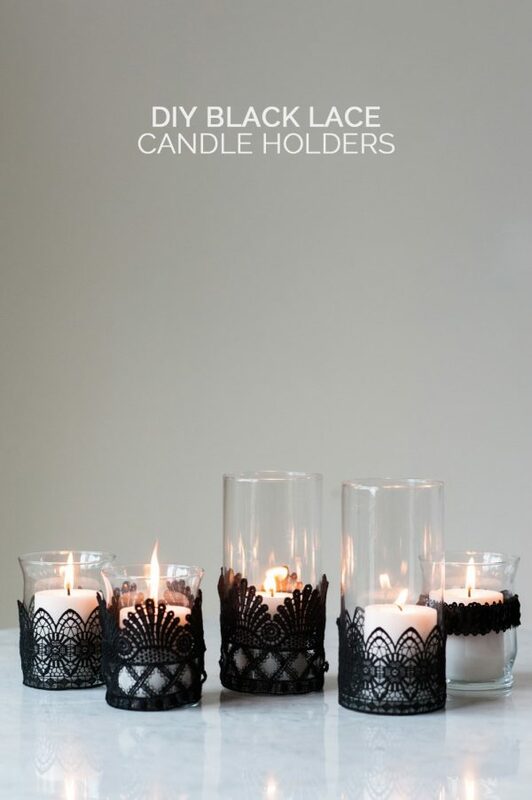 I feel like it comes so quickly after summer and I tend to go much bigger for Thanksgiving and Christmas, so Halloween feels a bit too much like work. 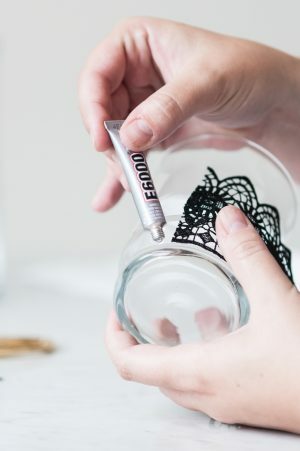 That said, this year I wanted to come up with a Halloween-inspired craft that was quick, simple and totally doable for those of you who, like me, just don’t want to be bothered with intricate, time consuming Halloween projects. 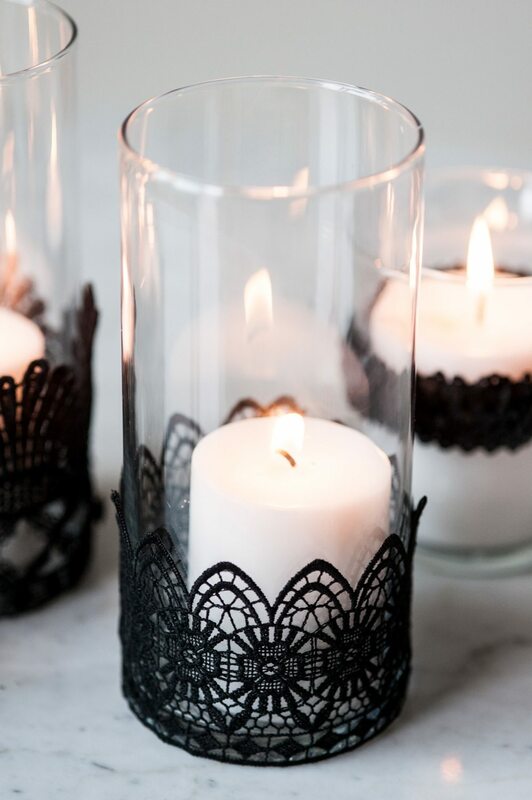 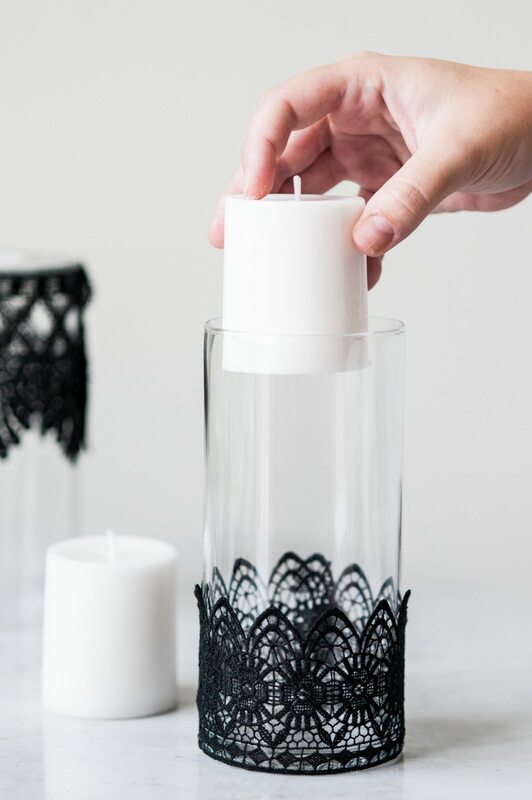 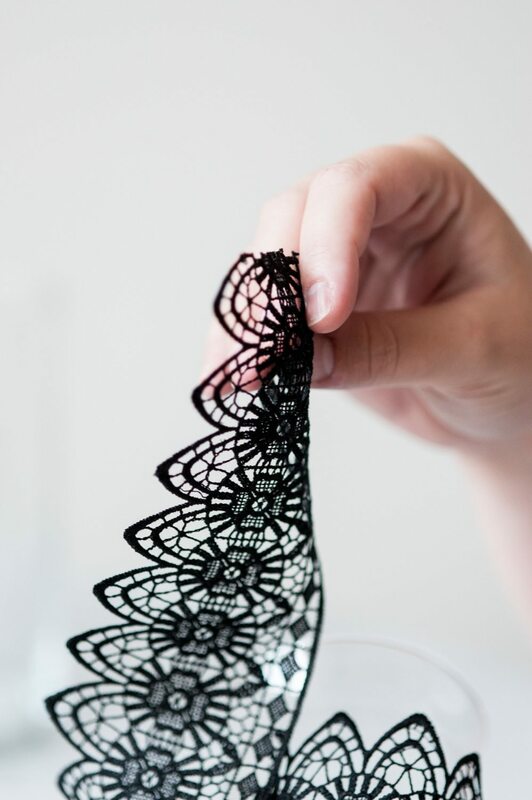 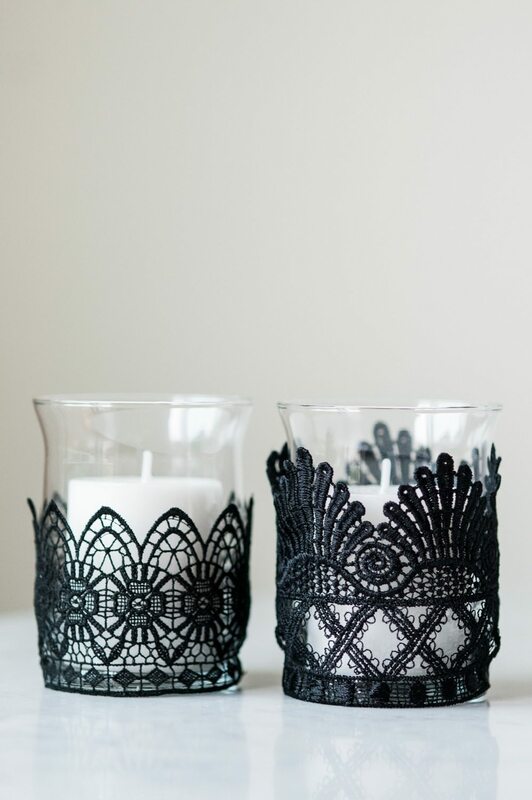 Enter these super pretty DIY black lace candle holders! They aren’t strictly Halloween either, because you could keep these out all year long or make them with any color lace you choose. Ready to get started? 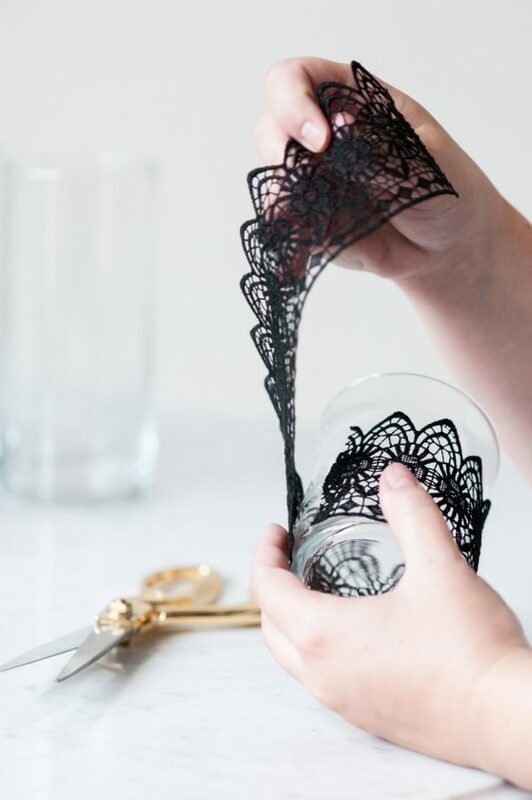 Let’s get crafty, friends! 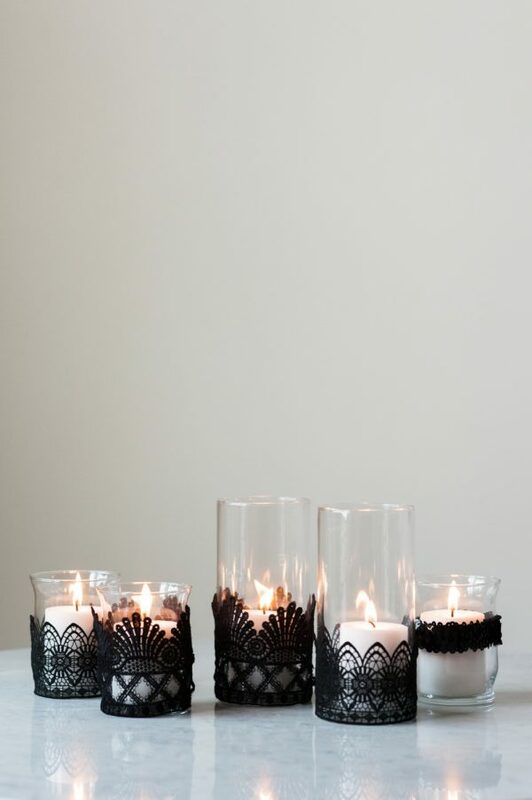 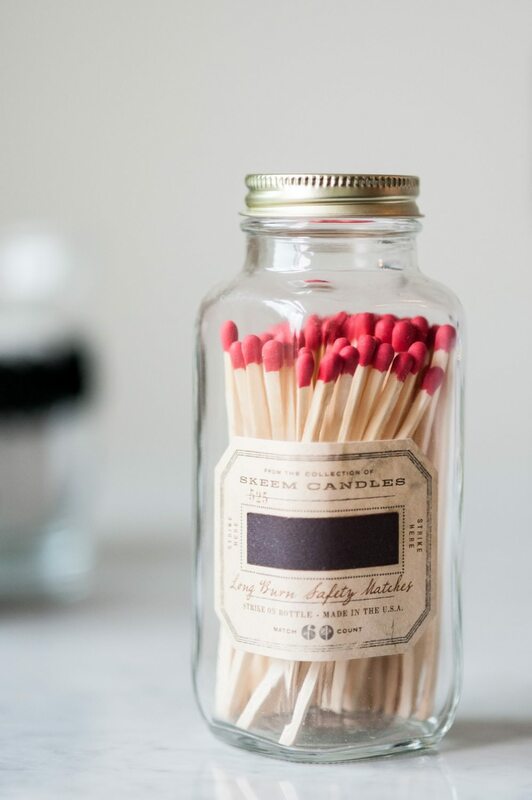 Begin with glass candle holders (or clear vases would work, too) that have been thoroughly cleaned and dried. Then measure your lace trim around the circumference of the candle holder by simply holding it up to judge the length you’ll need. 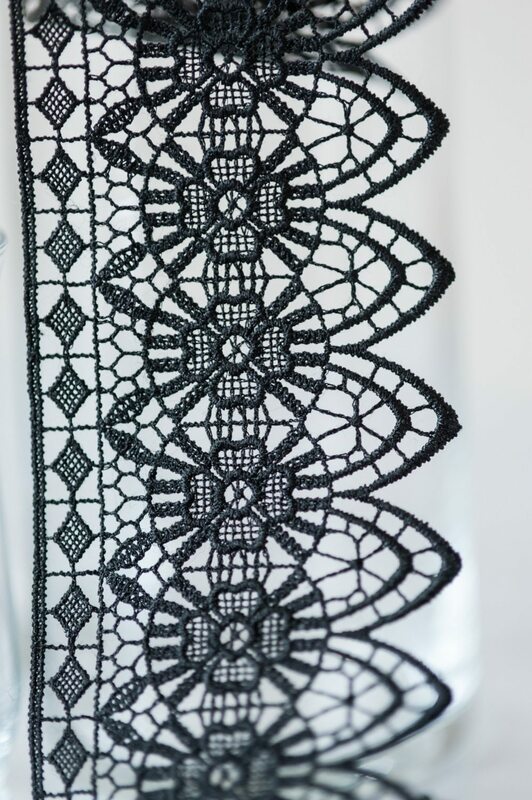 I picked my lace and sequins up in the by-the-yard trim section at Joann. 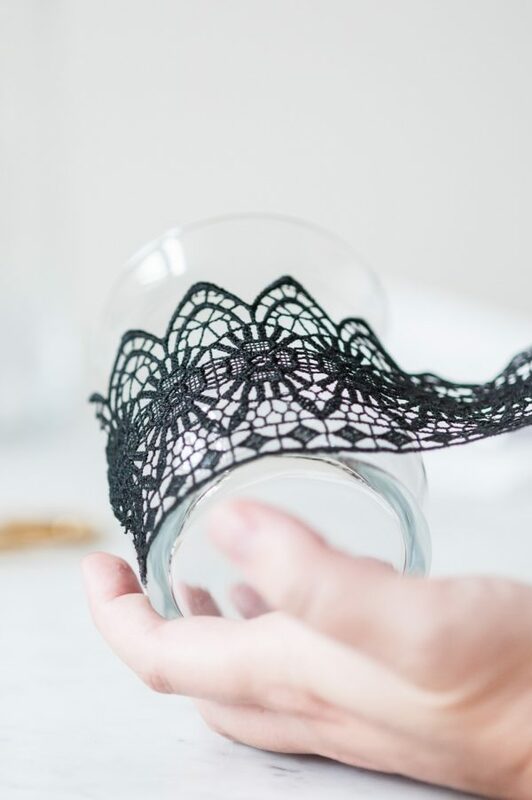 Be forewarned, trims like these can be a bit pricey, but you can find great coupons online for Joann pretty much 100% of the time and they have great sales, too. 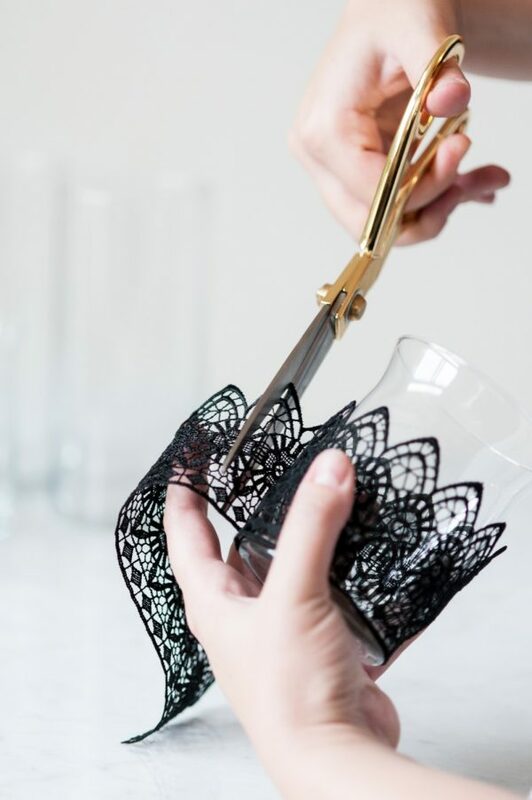 Allowing for a bit of overlap, trim your lace to size with scissors. 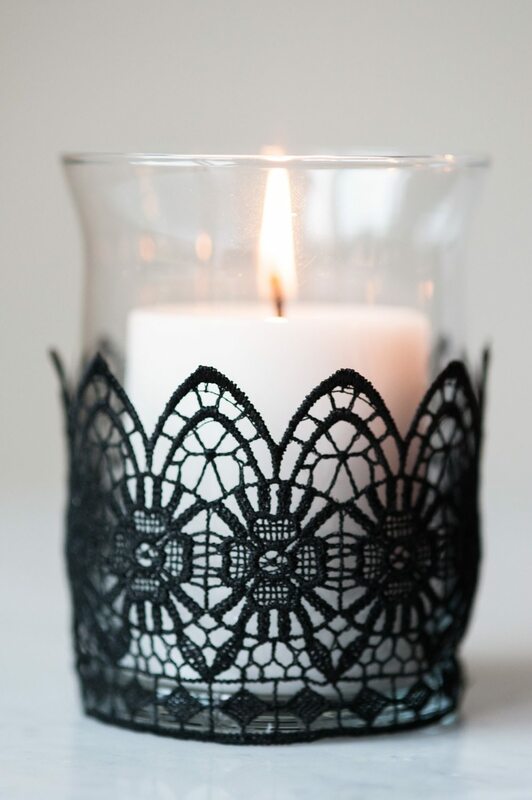 Next up, place a small bead of glue along the bottom rim of your candle holder and tap the corner of one end of the trim into the bead of glue to secure it in place. If you’re using hot glue, take care not to burn yourself. 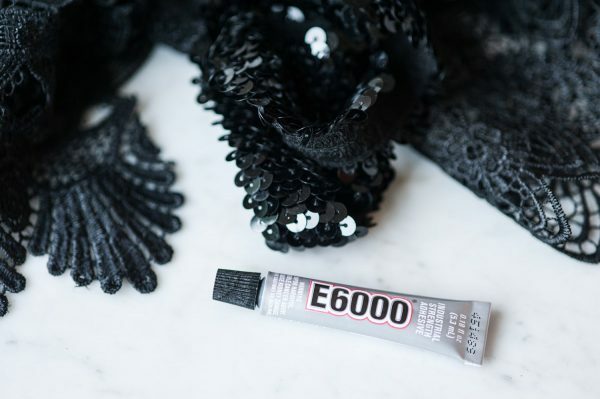 If you’re using E6000 or something similar, be sure to work in a super well-ventilated area or, even better, wear a mask while you’re working especially if you’re pregnant like this lady. 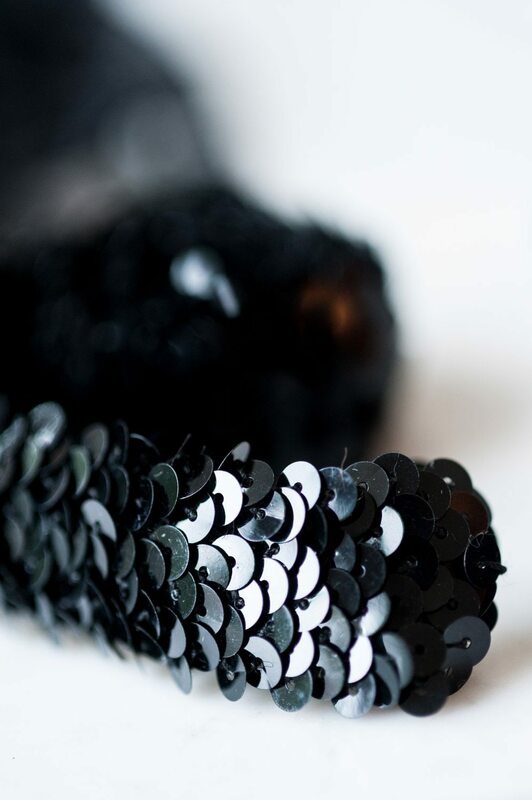 (Yes, I skipped out on sharing photos of my mask-clad face. 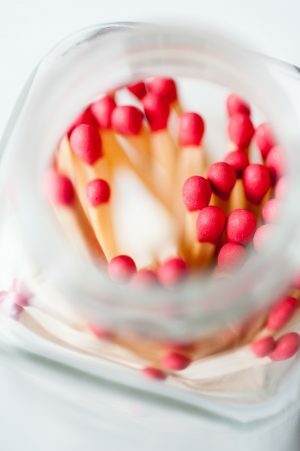 Nobody needs to see that sight!) Continue running a bead of glue along the rim, pausing every so often to secure the trim in place. 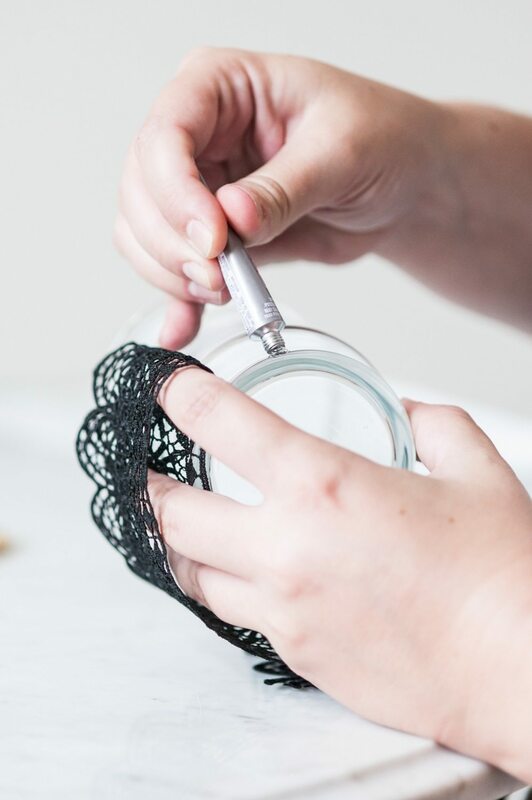 When you get to the end, pull it taught and then glue down the edge where the trim overlaps onto itself. Allow the adhesive to dry completely and you’re all set! 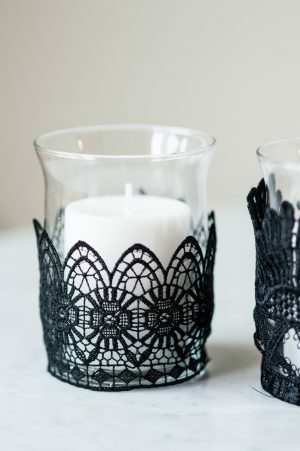 Load these bad boys up with candles (I personally prefer white candles with the black lace), give them a light and you have instant Halloween decor! Albeit of the really pretty, somewhat Victorian-inspired variety, which I totally dig. 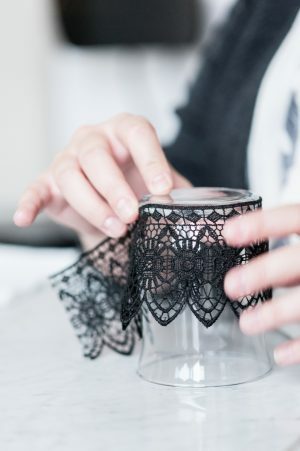 Scatter a handful of these beauties around the house with these DIY Halloween spider lanterns of yore and you’ll be ready for the trick or treaters when they come knocking at your door!